(1) The legislative powers of the Federal Republic of Nigeria shall be vested in a National Assembly for the Federation, which shall consist of a Senate and a House of Representatives. (2) The National Assembly shall have power to make laws for the peace, order and good government of the Federation or any part thereof with respect to any matter included in the Exclusive Legislative List set out in Part I of the Second Schedule to this Constitution. (3) The power of the National Assembly to make laws for the peace, order and good government of the Federation with respect to any matter included in the Exclusive Legislative List shall, save as otherwise provided in this Constitution, be to the exclusion of the Houses of Assembly of States. (b) any other matter with respect to which it is empowered to make laws in accordance with the provisions of this Constitution. (5) If any Law enacted by the House of Assembly of a State is inconsistent with any law validly made by the National Assembly, the law made by the National Assembly shall prevail, and that other Law shall, to the extent of the inconsistency, be void. (6) The legislative powers of a State of the Federation shall be vested in the House of Assembly of the State. (a) any matter not included in the Exclusive Legislative List set out in Part I of the Second Schedule to this Constitution. (c) any other matter with respect to which it is empowered to make laws in accordance with the provisions of this Constitution. (8) Save as otherwise provided by this Constitution, the exercise of legislative powers by the National Assembly or by a House of Assembly shall be subject to the jurisdiction of courts of law and of judicial tribunals established by law, and accordingly, the National Assembly or a House of Assembly shall not enact any law, that ousts or purports to oust the jurisdiction of a court of law or of a judicial tribunal established by law. 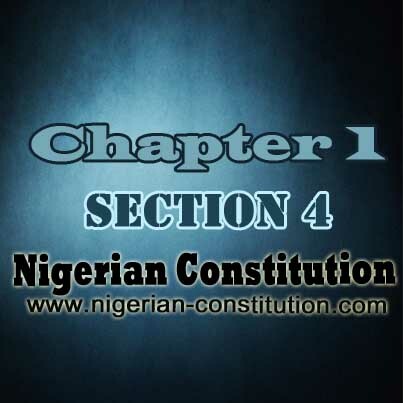 (9) Notwithstanding the foregoing provisions of this section, the National Assembly or a House of Assembly shall not, in relation to any criminal offence whatsoever, have power to make any law which shall have retrospective effect. Chapter 1. Part 2. Section 5. Executive Powers Chapter 1. Part 2. Section 6. Judicial Powers Chapter 1. Part 2. Section 7. Local Government System Chapter 1. Part 2. Section 8. New States And Boundary Adjustment, etc.